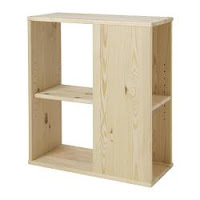 It looks like some weird little bookshelf, but actually it's a table leg. I just have to undo the legs from the left side of my desk--I mean table--and put this in their place and voila! Instant storage. 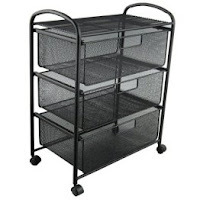 I bought black metal mesh baskets from Target that were designed to store DVDs but I will use as pseudo-drawers. Pretty cool, huh? Speaking of Target, I made out even better there. In addition to the DVD storage baskets, I got a black plastic bin for storing files and a black metal mesh (sense a theme here?) rolling cart to replace my battered white rolling cart which has seen better days.